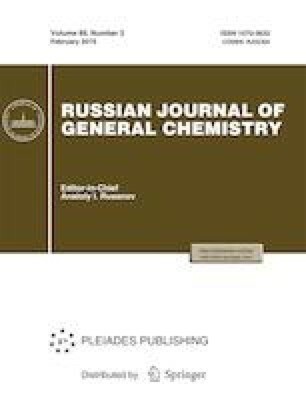 Spectral and basic properties of heterosubstituted porphyrins of anionic type have studied by means of spectrophotometric titration in comparison with their structural analog — tetraphenylporphine tetrasulfonic acid. The parameters of electronic absorption spectra and concentration ranges of existence of the mono- and diprotonated forms of the studied ligands as well as the constants of basic dissociation have been determined. Comparative analysis of the effect of the reactive site modification and the medium composition on the basicity of the compounds has been performed. Russian Text © S.A. Syrbu, S.G. Pukhovskaya, Yu.B. Ivanova, A.S. Vashurin, 2019, published in Zhurnal Obshchei Khimii, 2019, Vol. 89, No. 2, pp. 258–264.